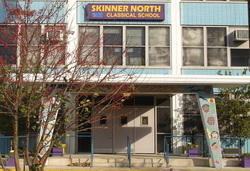 I am excited and honored to be the principal of Skinner North. As a school community, we offer a strong, accelerated academic program in Literacy and Mathematics and we emphasize teaching the whole child. Our teachers focus a great deal on scaffolding and differentiation of instruction and will work with you and your family to provide a great school atmosphere for learning and personal growth. 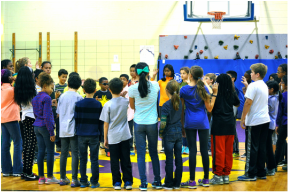 We seek to support students as individuals and help them develop the social-emotional skills to be self advocates and thoughtful participants in the world around them. We welcome and encourage parent participation as committee members, volunteers and chaperones, and as important voices in shaping our school’s climate and culture. This collaboration helps us strengthen our school community and build lasting relationships. For more details about our theory of action, please read the section below. Please always feel free to contact me with any questions, concerns or ideas. Establish an academically rich learning environment (which includes both data collection and analysis in order to differentiate instruction) that fosters personal, social, and emotional growth for each and every student. Students will be assessed, formally and informally, throughout the year. Students will take the following assessments, as well as others: Reading, Math NWEA, MAP (3x per year), PARCC, and have ongoing teacher-created assessments. For the testing schedule, please consult our calendar. Feel free to contact me with any questions.